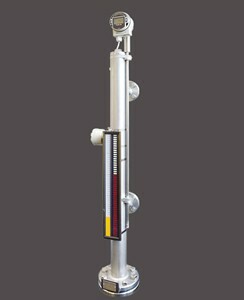 The NIVOFLIP is a magnetic level indicator for pressurized vessels with up to 5.5 m (18 ft) flange distance containing liquids. The device has the international PED (Pressure Equipment Directive) approval, so it can be used for level indication of pressurized vessels up to 100 bar g (1440 psi g) process pressure. The high temperature types are applicable up to 250 ˚C (482 °F) process temperature. The NIVOFLIP can be equipped with optional limit switches or with NIVELCO’s NIVOTRACK high-precision magnetostrictive level transmitter if point-level detection or continuous level transmission is required.